In preparation of the upcoming Apple Watch launch, Apple on Thursday announced a new software developers kit called WatchKit for creating apps tailored for the company's highly anticipated wearable device. Announced on stage by Apple CEO Tim Cook, WatchKit will be made available to developers in November, in time for app creation and testing before Apple Watch hardware debuts early next year. 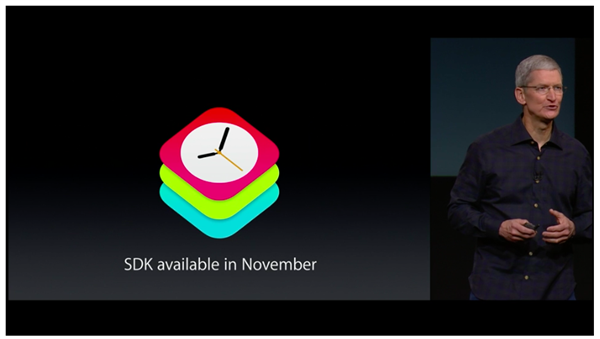 When Apple showed off Apple Watch at the iPhone 6 event in September, only a few first-party apps were demoed. With the forthcoming WatchKit SDK, the smartwatch should have a decent population of apps from which to choose at launch, important for content consumption devices. Today brought no news on a public debut, but Apple is still shooting for early 2015.